I've been married to a wonderful man for over three months now. That's no thirty years, but still, I know more about marriage today than I did three months ago. Read that recipe slowly, carefully, and all the way through before you begin cooking. Otherwise your special holiday breakfast will be served a day late because you'll learn as you're whipping it up that it has to sit overnight in the fridge. He means what he says. It's as simple as that. "I'd do this," doesn't mean, "You should do this, too." It simply means, "That's what I'd do." Don't read into his words or actions. When he treats you better than you deserve, don't think you have to slowly earn your way back into his graces. Receive his grace gratefully. It won't all be like you imagined. Let your expectations go. Kindness is the new romance. It will take longer than you think it should to get into a routine. That's normal. You'll get there! Don't nag, but also don't "stuff" your feelings. Share your thoughts graciously once, and then be quiet and pray for him. Don't take it personally if he's on his phone for a bit. It's not your competition; it's a way for him to relax. You need good girlfriends. It will take awhile to develop those, so get to work now. Ask a woman over for tea once a week if you can (Prov. 18:24). In the meantime, no friend compares to God. Cultivate this friendship each morning (Ps. 16:2). Continue that premarital counseling post-marriage if possible. We still meet with a couple once a month, and it's been so helpful as we've made this transition. Plan something special each year to celebrate your anniversary. Schedule a date night once a week. You don't have to solve everyone's problems. 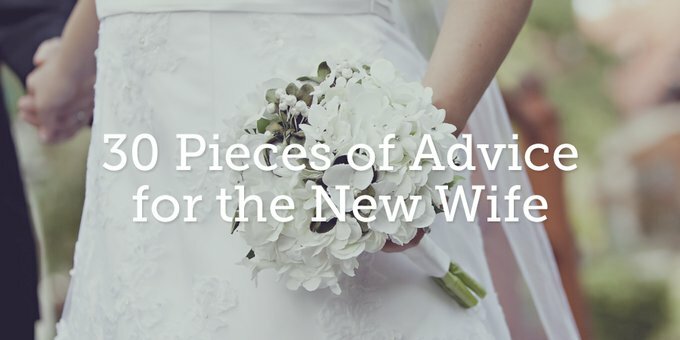 This is a unique, important season for you and your new spouse. Be slow to say, "Oh, I can help with that!" Care for your soul before you care for your home. If your soul is not at rest, no matter how clean your home is, its environment will not be restful. Spend time together. It doesn't matter if you'd get more done if you stayed behind and he went to the store; go together. Don't defend yourself every single time. You will see a lot of ugliness in your life that you never saw before. Don't run from it or deny it; embrace the gift of being able to see your sin more clearly as well as the love of God through your spouse. Give your husband space when he's frustrated. You don't have to talk through everything immediately. At the same time, don't let too much time pass before you talk through an argument. Seek to understand. What was he thinking and feeling when this happened? What were you thinking and feeling? Get on the same financial plan. It's good to work together toward a common goal. Spend that wedding gift money together. It's fun to shop together, as long as it's not clothes shopping. That's a bad attitude waiting to happen. Find a spot in your home to regularly write each other sweet messages. Pack his lunch before he leaves for work each day. Don't be easily offended. Assume the best (Prov. 19:11). Leave your insecurities at the marriage altar. He chose you. You're enough. Don't try to impress him. He probably won't be impressed by the things you're impressed with about yourself. He chose you. You're enough. Don't keep score of who's doing more around the house. You're a team. If you need help—rather than resenting him for not doing more—ask him for help. Communicate, communicate, communicate—in and out of the bedroom. Regularly ask him how you can serve him that day. "Godliness with contentment is great gain." Marriage may mean a smaller, more isolated world. Remember that life is made up of many seasons. Thank God for this one—He sets your boundaries (1 Tim. 6:6, Acts 17:26–28). What have I missed? What would you add to this list? Previous Post Am I a Failure?